Three security printers, beginning in 1870 and lasting until the early 1880’s, printed the Bank Note issues. These firms were the National, the Continental and the American Bank Note Companies. The order in which they became producers of U.S. stamps should be memorized. Take note that the initial letter of each company, “N”, then “C” and then “A” is in reverse alphabetical order. By remembering this N-C-A sequence you will have taken the first step in your classification efforts. For years collectors have been frustrated by the “secret marks”, or lack thereof. The paper and grills have also puzzled them. In short, one of the problem areas most frequently encountered by U.S. collectors has been the Banknotes. Dealers are no less guilty. Don’t assume that just because one makes a living from stamps that the individual is unfailingly competent at identifying every stamp that appears in their sight. 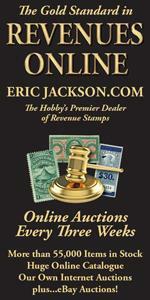 You must become proficient in qualifying your philatelic purchases. Knowledge is the key. Let’s learn the quick identification techniques that will eliminate the majority of the confusion that has prevailed over this Issue. This copy of Scott No. 215, the four-cent carmine stamp of 1888, was among the most striking of the Bank Note issues. Like all such stamps printed by the American Bank Note Company, it is on soft paper. First, gather all of your Bank Note stamps that need to be identified. Remove all of the grilled stamps from this group. These grilled stamps will all be National issues unless Lady Philately has smiled on you and you encounter the supreme rarity, namely the Continental “J” Grill. 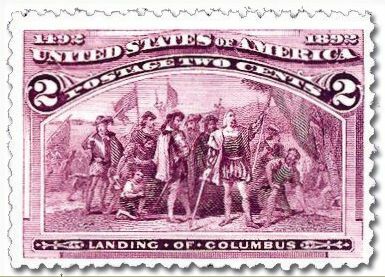 The author’s “test stamp” for proving a soft paper stamp is the two-cent Columbian issue, Scott No. 231. It’s a great stamp for using Herman “Pat” Herst’s “flick” test. Years ago I learned that if I took a known hard paper stamp and a known soft paper stamp, I would have a ready reference file for comparison purposes. These reference stamps are NOT Bank Note issues. I use the 2¢ Columbian as my soft paper reference stamp. The soft paper American Bank Note stamps were printed on the same paper as the Columbians. My hard paper reference is Scott 65, another inexpensive issue. The hard paper Bank Notes were printed on the same paper as this common 1861 stamp. When you have selected one each of your hard and soft paper reference stamps, hold them up to a light and notice the difference. The hard paper will show an even texture throughout the stamp and it will be a bit translucent. The soft paper will be coarser with an uneven texture. It will also be mottled in appearance. There is another test if you are still in doubt. It is known as the “flick” test. It was demonstrated to me many years ago by Pat Herst. Hold your reference stamps to your ear and gently flick the paper. You can not help but tell the difference. A word of caution is in order. Years ago the Bank Note Issues were much less expensive than they are today. Use extreme caution if you decide to use this “flick” test as you can easily crease and damage an expensive stamp. Your pile of soft paper stamps are those of the American Bank Note Company. The hard paper pile will be either Nationals or Continentals. We’ll need to identify these by color or secret mark. The Continental Bank Note Company obtained the printing contract for United States stamps in 1873. Not desiring to have their work confused with their predecessor, The National Bank Note Company, they added “secret marks” to their dies of the one-cent through 12¢ denominations so as to make identification of their product an easy task. They felt that their product was superior and they did not want to be accused of poor workmanship. The secret marks of the one-cent through 12¢ denominations are fairly easy to discern by comparing your stamps with the illustrations in the Scott Specialized Catalogue. Don’t have one? One of a few years ago can be picked up for a very modest cost. Scott No. 141 The National Bank Note Co. printing of the 15-cent value. White Wove Paper—Thin to Medium Note the line over the “os” of “Postage” at the top of the stamp that is nearly complete. See text on differentiating between this National printing from the Continental. The 15¢ is another story in itself. The following was relayed to us by our good friend Tom Priester. He visited the late Lester Brookman in his Minneapolis stamp shop in 1968 and Mr. Brookman offered an indisputable method of differentiating between the National and Continental printings of this stamp. Incidentally, Brookman was an openly warm and friendly person who loved to “talk stamps”, especially the early issues. 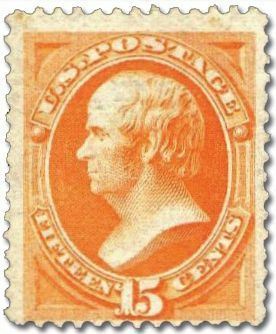 He said that the National printing of the 15¢ has a line over the “os” of “Postage” at the top of the stamp that is nearly complete. The Continental printing has an open spot on the line over the “os”, except for the ribbed paper varieties on which the line is nearly complete as on the National. Many experts believe that the ribbed paper 15¢ was the first Continental printing of that denomination and thus produced from plates that had not yet been worn down so much that the fine lines were no longer visible. Scott notes that, on the 15¢ Continental, “In the lower part of the triangle in the upper left corner two lines have been made heavier forming a ‘V’. 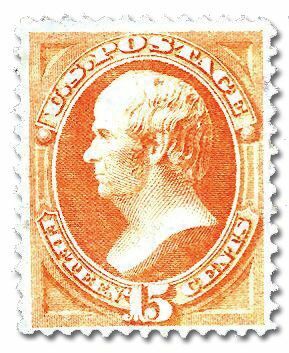 This mark can be found on some of the Continental and American (1879) printings but not all stamps show it. The National 15¢ is always a bright orange while the Continental is a yellow-orange. The later American Bank Note Company printings are all re-engraved and can easily be told apart from the others by a glance at the Scott illustrations. Students have long debated as to whether or not the 24¢, 30¢ or 90¢ exist with secret marks. None has been found. It is generally accepted that secret marks were indeed added to the dies of these denominations but that new plates containing these secret marks were not prepared. Today, the primary identifier for these three denominations is by color or paper. The 24¢ purple can generally be assumed to be a National printing although the Philatelic Foundation has certified as genuine a 24¢ on vertically ribbed paper. 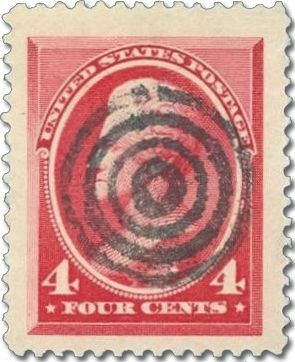 That is the unique stamp listed as Scott #164 showing a valuation of $357,500 as the price paid at a 2004 auction sale. Specialists believe that only Continental used ribbed paper. If Continental also produced this denomination on regular paper, it is not discernible from the National Scott #153. The 30¢ and 90¢ are identical in design in both the hard paper printings of the National and Continental companies. If a grill is undetectable, take a look at the color. The 30¢ National is almost always a jet black, very similar to the 30¢ American soft paper stamps. The 30¢ Continental is a grayish black and sometimes a greenish black. The 90¢ National is definite rich carmine while the Continental is a rose-carmine (close to dull carmine). With regards to the grills that appear on the Nationals, they are as follows; “H” Grill on all denominations. This is about 10 x 12 mm with 11 to 13 by 14 to 16 points. This grill is often very faintly impressed on the paper and not all the points will show on every stamp. The second grill type, the “I”, is about 8 ½ x 10 mm with 10 to 11 by 10 to 13 points in the grill area. This “I” Grill appears on certain 1¢, 2¢, 3¢, 6¢ and 7¢ denominations of the National printings. The Continental “J” grills were of an experimental nature and measure about 7 x 9 ½ mm.